Office 2016 for Mac has quite different and extensible color selection options for text, shapes, pages etc. that are the envy of Office for Windows. Choose from the same range of colors as Windows, but in many different ways. All these additional features in Office for Mac are from Apple’s macOS operating system, not Microsoft. Our look at the options is from macOS Sierra v10.12.6 but the same or similar applies to recent versions of macOS. These color selectors apply to Office 2016 for Mac, Word for Mac, Excel for Mac, PowerPoint for Mac and Outlook for Mac. The main color menu on the Home tab is the same as Office for Windows. Theme and standard colors plus a gradient selector. Once you’ve selected a color, it will appear on the main selector under ‘Recent Colors. Choose ‘More colors’ and there’s five different tabs to choose from; Color Wheel, Color Sliders, Color Palettes, Image Palettes and Pencils. All the tabs have the place for the ‘eyedropper’. This lets you magnify any part of the screen and select a visible color. Click on the ‘dropper’ then move about the screen. Very handy for matching the color from an image or logo. The empty boxes at the bottom are called the Swatch Drawer. You can make your own collection of preferred colors. 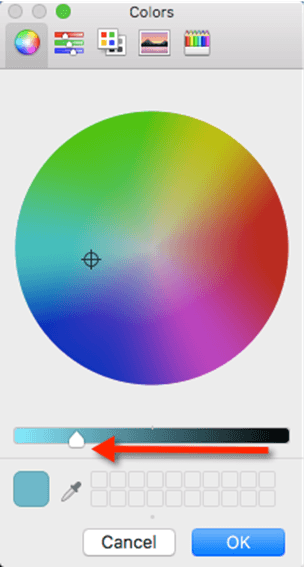 Drag a color from the large swatch at left or any color on the main part of the color selector. If your color wheel is all black, like ours was when we first looked at it, drag the slider to the left. Click inside the circle to choose a color then move the slider for the shading. This is where you can enter RGB, CMYK or HSB color values. Apple supplies various color palettes or color selections. Apple and Web Safe Colors are fairly standard but Crayons has a nice selections of shades. You can add your own palettes or share them with others. Look under the ‘cog’ icon. This option is very interesting though it doesn’t look like much. Click on the cog icon and you can import any image on your Mac or use an image in the clipboard. Once imported, you can click anywhere on the image to select that color. Really useful for color matching logos or products images. Choose colors from a pencil box. As you hover over each pencil it ‘pops up’ and the name appears at the top. The macOS system allows for extensions to the color selector. Search online to find plugins, though many have been withdrawn, partly because they’ve been superseded by changes in the system tabs. Shades is just one example. It adds related color ‘swatches’ that you can choose from. Go to RobinWood.com for more detail on the Apple color selectors, palettes and how to use them.